For decades, upright exercise bikes have been a staple in home gyms. Since most people already know how to ride a bike, they are naturally curious to find out more about these affordable indoor machines that offer convenient workouts for all fitness levels. Also known as a stationary bike, upright exercise bikes resemble road bikes without the wheels, and offer the advantage of having no worries about flat tires, chain slipping, traffic, and weather. The rider can stand up to pedal or lean forward on the handlebars in a racing position, and many models have pedals with clips to keep the foot from slipping off. With a stable frame and magnetic resistance, an upright offers a strenuous workout without ever having to leave home. The upright is the first type of indoor exercise cycle most people think of. There are also recumbent bikes, which is similar except that the rider is in a bucket seat with a backrest and the pedals are located in a forward position. It is mostly a matter of personal comfort as to which bike to choose, although folks who have balance issues will feel safer and more comfortable on a recumbent. Both types of bikes are easy to use. The resistance range can be left at zero for easy workouts or cranked up to simulate grueling uphill pedaling. The seat is adjustable; or you can buy an upgraded replacement saddle with more padding and anatomical comfort than the factory-installed seat. Most bikes come with challenging pre-programmed workouts for changing the daily routine. Stand up and pedal! You can’t do that on a recumbent model. A compact footprint. 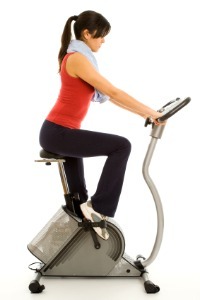 Upright exercise bikes tend to be much shorter and often lighter than recumbent bikes. A choice of a variety of frames and styles. There are open, step-through frames for easy mounting or styles with a traditional center bar. 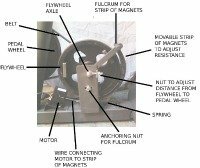 You can choose from bikes featuring magnetic or electromagnetic resistance, or open flywheel resistance such as the legendary Airdyne, as well as chain drive stationary bikes. Pedals can take toe cages in case you are a serious bike rider. High-end bikes offer Heart Rate Control programs, wireless chest straps, interactive training programs, and incline and decline to match terrain. 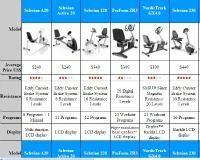 Upright exercise bikes are more affordable than recumbents, and both types of bikes are far more affordable than treadmills and elliptical trainers. Look for Free Shipping options as well. The main disadvantage of an upright is often soreness caused by sitting too long on the saddle seat. Since men and women have different anatomical issues, it is a good idea to research saddles that offer more padding. The recumbent, with its bucket seat, is obviously more comfortable. If you have knee problems, you might also prefer the design of a recumbent over the upright. Additional features to look for when shopping for a good bike include a heavy frame for a steady ride, quiet operation of the flywheel, varying resistance levels, and interactive programs. Less important but nice to have features include a bright backlit display screen, wireless network compatibility for the Internet, book holder and water bottle holder. Be sure to check the warranty on all of the upright exercise bikes you research. Since bikes require far fewer repairs than treadmills, the warranty is not as vital but it should be strong enough to back your investment in the equipment.